On Monday, I told you how I love making lace shawls. You’ll notice that I didn’t say I love wearing lace shawls. This is because I am a pretty big tomboy. 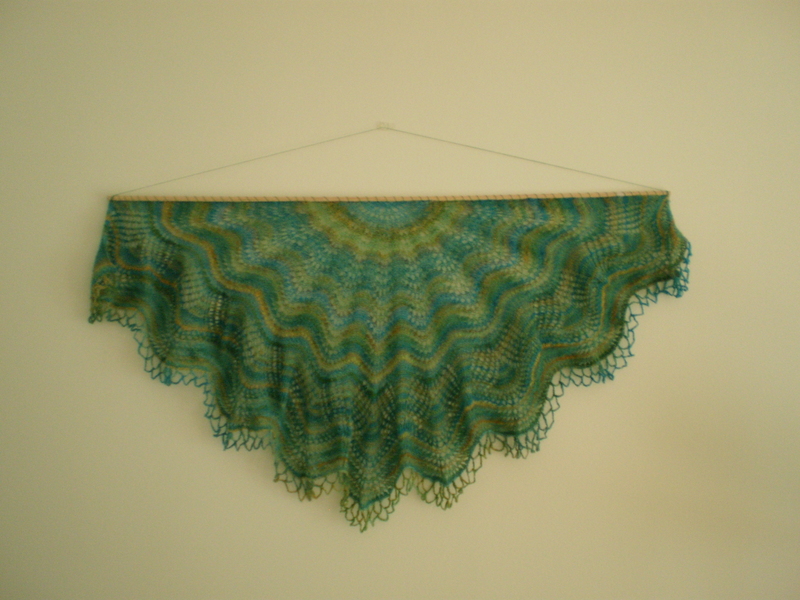 I love how lace shawls look, and I love making them, but I always feel like a monkey in a top-hat when I wear them. So, I had a whole stack of gorgeous shawls that did nothing but sit in my closet, waiting for moths to show up and start munching. Something had to be done. How could I display them? I tried hanging them over my closet door, but then I couldn’t open and shut the door without them falling all over the place. I tried putting one over a table lamp, but that looked like something from a palm-reader’s office (and I was paranoid about setting the whole place on fire). And, so my lace shawls went back into the bottom of the closet again. Until I realized something. These lace shawls were basically great big art pieces. And my house was full of empty walls, begging for art to be put up. My Panache is a medium sized shawl (about a 40 inch wingspan), but my Aeolian shawl, is a monster. It’s at least 60 inches from point to point, so sewing it to a yard-long dowel wouldn’t fly. I thought about it for a long time, and then the perfect solution came to me while I was doing yard work. I cut some long (6+ feet) switches from one of the trees in my yard, and lashed them together with twine. I added a loop of twine and hung them from a nail in my knitting studio. 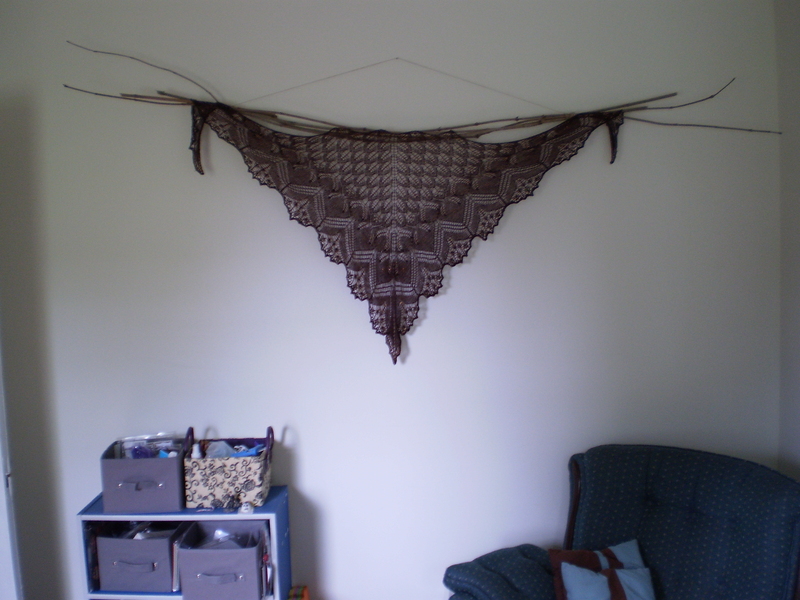 Then, I looped the Aeolian shawl over the ends. I really like how it turned out. It’s pretty, and rustic, and if I ever want to display another shawl (or scarf, or sweater, or blanket) I can switch them out easily. This entry was posted in Techniques and tagged aeolian, art, decoration, dowel, home decor, penache, shawl, sticks, wall on May 7, 2014 by onemilljellybeans. Those are incredible! And I really like the rustic look with the branches. Great job!